On the north side of my grandmother’s house was a secret garden. It was filled with ferns, lily of the valley, tomatillos that reseeded themselves each year AND a mulberry tree. It was cool and shady and I would pick the mulberries to eat. Later on, we lived in an apartment with a mulberry tree in the yard. I picked those mulberries and made jam—the stems made an additional crunch. Now we have a large mulberry tree in our backyard. It has weathered several hurricanes and was pulled out of the ground by one of them. We lopped off a couple of low-hanging branches and it has seemed to revive itself. Our dogs have entertained themselves by climbing that tree in a fruitless effort to catch the squirrels that taunt them. And for a long time a small owl lived on one of its branches–to be blown away by Hurricane Rita. 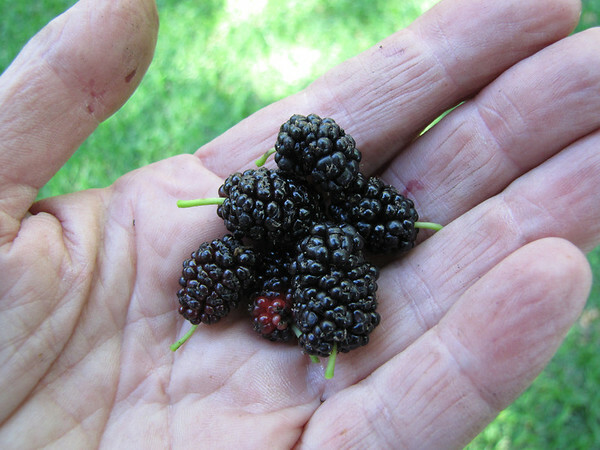 So once a year I get to taste the mulberries–and we have purple birdie poop on our sidewalk, driveways, and vehicles. smugmug seems to be taking a nap right now–so I’ll post those pics later.